The later model C3 Corvette hasn’t yet reached its stride when value comes into play. This Nice Price or Crack Pipe ’75 has a stick and some Centerlines going for it, but is that enough to make its price feel like it’s got it going on? Did you all mistakenly sprinkle cocaine instead of sugar on your Cheerios yesterday? Whatever the cause, a whole bunch of you got pretty excited about the 1964 Jeep Gladiator we featured, enough so in fact to give its nearly five-grand asking a massive 88% Nice Price win. I don’t ever advocate drug use, not even when it’s part of a balanced breakfast, but I do agree that olive drab J-200 seemed to be a pretty sweet truck. That Jeep of course, was for getting work done, and when you get that work done you’re going to want to play, and nothing says player better than a C3 Corvette. You know that there are a number of venerated Corvette model names—cars like the LT1 and Z06—each named after a specific engine option that made them rip-roaring sports cars. You might note that among those revered models you will not likely find the L48 included. That’s because the ‘70s L48—the base C3 Corvette at the time—is considered to be one of the marque’s worst models ever. How, you might ask, did it earn that unfortunate title? Well, as you all know the ‘70s were a dark era for horsepower and the ‘Vette suffered right along with everybody else. This 1975 Corvette Stingray was shipped from the factory with a mere 165-bhp and 255 lb-ft of torque from its lazy-assed 350-cid V8. And that was even with a 4bbl carburetor! You would have been better off back the to spend a little more and get the 205-bhp L82. That however was still just a 350, this being the first year since 1964 for the ‘Vette not to offer a choice of engine displacement. Okay, so this targa coupe has less horsepower than the new Honda Civic with its turbo 1.5, but that’s not so bad. I mean, at least it doesn’t have a CVT. Take that, Honda! No sir, this L48 has a proper four-speed stick and a clutch pedal. It also has A/C in case you thought 165 was too many ponies to put to the rear tires. Those tires wrap around polished Centerline-style wheels under the high eyebrow wheel arches. The silver paint on the fiberglass body is patchy in places and there seems to be plugs in the back where a luggage rack once sat. Speaking of the back, that ducktail spoiler on the rear end is an aftermarket cap, not factory. The interior looks tidy—and factory, less the mats—with no rips or tears in the upholstery. Mechanically, there’s the claim of a new exhaust, steering box and shocks, and despite its wearing of antique car plates it’s claimed by the seller to be a daily driver. This may be one of the worst Corvettes of all time, but it’s still a Corvette, and the C3 cars are among the marque’s most handsome. That 350 is easily upgradable, as long as your state or nation’s emissions requirements allows, and of course who doesn’t love targa tops? The asking price for this ‘Vette is $7,500, and that gets you a car that will probably be more rumble than race, but should be just fine for cruise night or getting some tail down at the Black Angus. 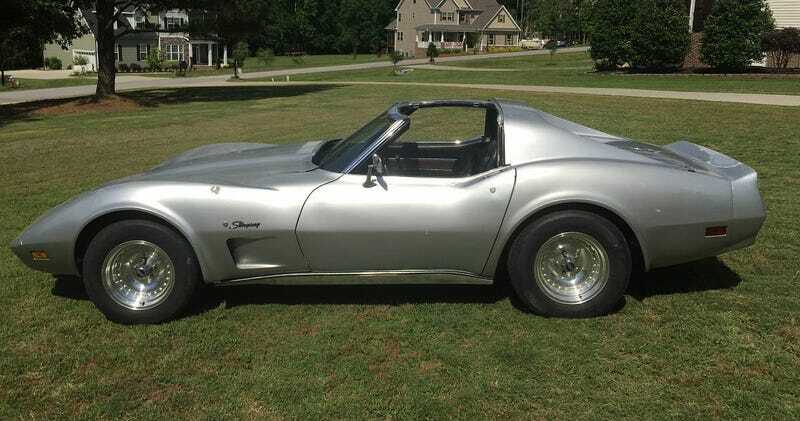 What’s your take on this lesser Vette and that $7,500 price? Does that seem like a deal to get stung by a Stingray? Or, is that too many C notes for a ’75 C3? Raleigh SC Craigslist, or go here if the ad disappears.